A renowned web hosting company who are servicing more than 2 million customers over a decade is Bluehost. Almost all of you are familiar with this name. Bluehost provides the most important web hosting tools and let the customers maintain their site with an easy access. Happy to know that it is one of the most popular web host companies and it is cheaper than other web hosting companies. Bluehost servers are based on PHP7, HTTP/2 and NGINX+ caching. This one of the most reputed web host company was founded by two famous persons Matt Heaton and Danny Ashworth. It was founded in 2003 in Provo, Uath, USA. 750 skilled workers are appointed for the improvement of the company. Though it is founded in 2003 the plan was imagined by Matt Heaton in 1996. 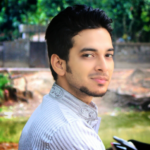 He first created two other web hosts but finally, Bluehost was established in 2003. Bluehost kept working for the improvement of the company and in 2009 they invented CPU throttling, in 2013 they announced VPS and dedicated web hosting. And later on, the keep going and still working. The company is owned by Endurance International Group. 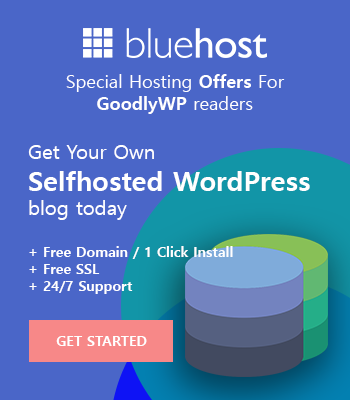 Those who don’t know well about Bluehost need to know what actually Bluehost offers. It is a web hosting company. They offer different kinds of hostings such as VPS hosting, cloud hosting, dedicated hosting, WooCommerce hosting, and others. Along with hostings they offer domain services. They have also different plans for different hosting for the people of different kinds of businesses. With different plans, they have added different features according to the price and the needs of customers. Please Note This: Some of the links in this post are ‘affiliate links.’ This means if you click on the link and purchase the item, I will receive an affiliate commission. 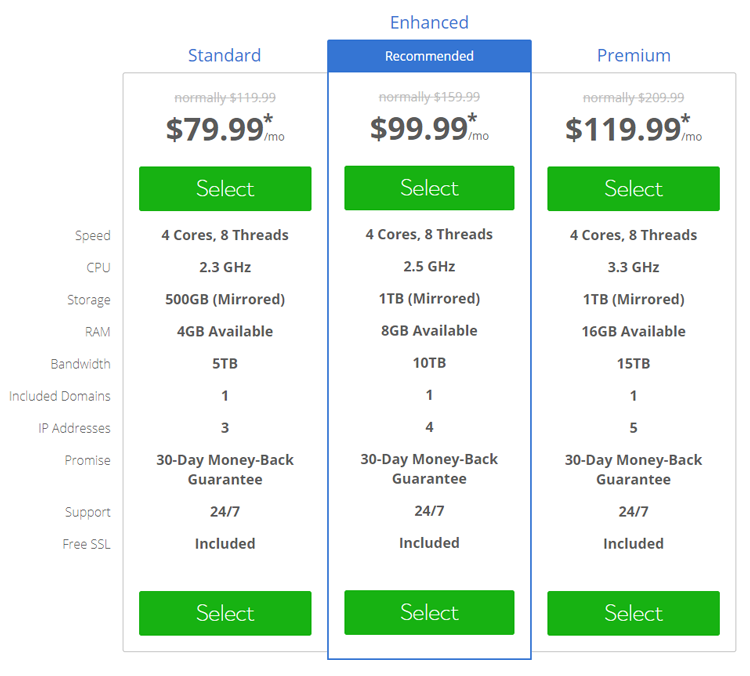 Also, the Hosting Package price can be different based on their Discount Period. Actually, people who are looking for a web host for their personal website or businesses then Bluehost is for them. Owner of small and large businesses or WordPress customers are the main clients of Bluehost. Now it is time to give you all the information about their hosting plans that you can buy from Bluehost. There are six types of hosting plans for different kinds of users. From low to high rate you will get web hosting plans. Each plan has some different offers. Let’s get familiar with them. If you do not choose your Domain Name yet, then just do it. You don’t have to pay for it. Bluehost offers you a completely free domain. However, if you have already a domain then no worry. This domain is free for you. So don’t wait to grab your free domain today. Shared hosting is a web hosting service which allows multiple websites reside on one web server. People who are creating a website for the first time this hosting is appropriate for them. Shared hosting comes with 3 plans. Starter: At the beginning, one gets it at $3.49 per month though jumps up to $7.99 per month at the regular price. This is the cheapest plan with great offers. From this plan, you will have a website with the space of 50 GB. You will also get 1 domain and 5 parked domains. They are also proving unmetered bandwidth. There are also some other feathers for you. You can have 100 email accounts with 500 MB of storage and $50 in market offer. Plus: Getting this plan you have to pay $10.49 per month. This plan offers more than started and a little more costly. Great advantage of this plan is you will get unlimited websites from this plan. Another mind-blowing fact is you will get unmetered space and bandwidth. There is one domain provided by them but happy to know that you will have an unlimited subdomain and parked domain. You can create unlimited email accounts having this plans. Another fact makes you happy that you can have unlimited space on emails along with $200 in marketing offer. They are also offering Global CDN and one SpamExperts. 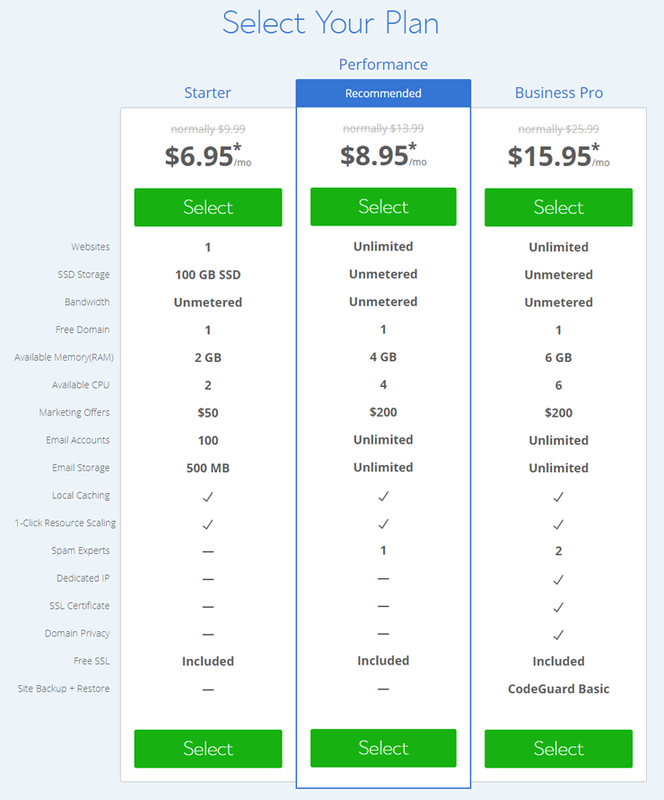 Business pro: This this the most expensive plans of shared hosting. You have to pay $23.99 per month for this plan. You will get unmetered space and unmetered bandwidth. 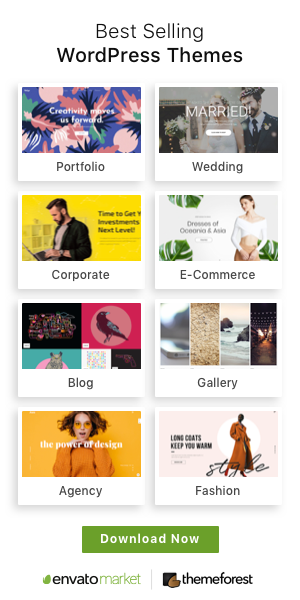 Unlimited websites can be created. You will have one domain with unlimited sub and parked domain. Unlimited emails with unlimited space along with $200 in marketing offer. Some most necessary features are also included by them and make the differences in price per month. They have included up to $180 in extra annual benefits. They are also providing one SSL and one IP address. They are also offering two SpamExperts. Domain privacy, SiteBackup Pro and enhanced performance is also included with this plan. You will get 2 core CPU and SSD storage of 30 GB. Happy to know that bandwidth is unlimited. You will get advantage of 2 GB RAM. They are also providing 1 free domain and 1 dedicated IP. You will also get 30, days money back guarantee. Enhanced: First-month the cost is $29.99. Then it is up to $59.99. In this plan, you will get 2 core CPU. SSD storage is enough. It is 60 GB. They are also offering RAM of 4 GB and. Here the bandwidth is unlimited as well. One free domain and 2 dedicated IP is included. They are also giving 39 days money back guarantee. Unlimited: This is the most precious plan of VPS hosting. Up to $119.99 is costed after the first month of $59.99. 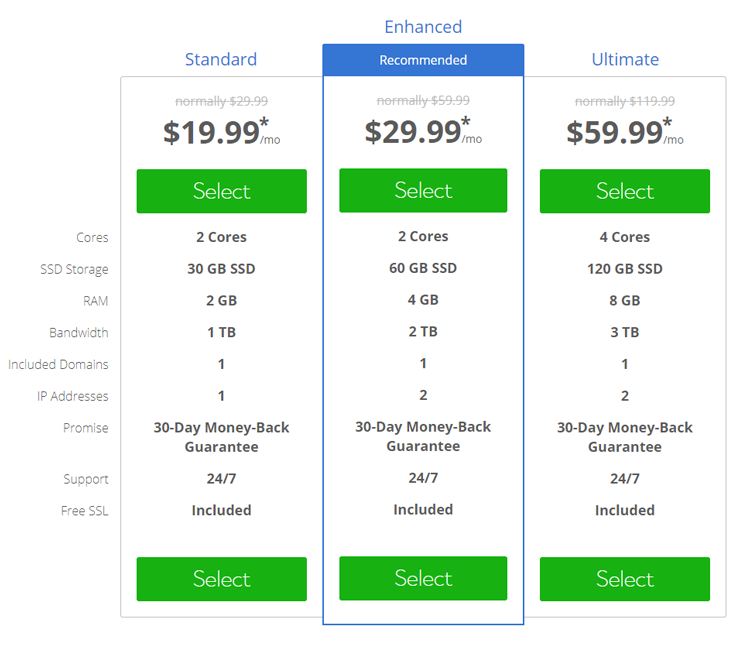 This expensive plan offers 4 CPU cores with SSD of 120 GB. They are providing 8 GB RAM and unlimited bandwidth certainly. 1 free domain and 2 dedicated IP like the enhanced plan and 30 days money return guarantee. Standards: First month starts with $74.99 then up to $149.99 after that. They are providing 4 core CPU with 8 threads. Get the storage of 500 GB (Mirrored). The Bandwidth is 5 TB and you will get the RAM of 4 GB. There are 1 free domain and 3 dedicated IP. 30 days money back guarantee is ensured. The CPU speed provided by this plan is 4 core and 8 threads. Bandwidth speed is awesome. It is 10 TB., Storage is 1 TB (Mirrored). They have included the RAM of 8 GB. Also providing 1 free domain and 4 dedicated IP. 30 days money back guarantee is also given. Providing good features such as CPU speed is great with 4 cores and 8 threads. The RAM is 16 GB and storage is 1 TB (Mirrored). Bandwidth speed is 15 TB and it is excellent. They are also providing 1 free domain and 5 dedicated IP. 30 days money back guarantee is also assured. People who want to create online shop can grab this WooCommerce hosting. Shopping carts like Zen, Cube, Agora, and OS are offered by Bluehost. They have also provided OpenPGP/GPG Encryption. They have also solved the tension about the transaction by providing SSL certificate. 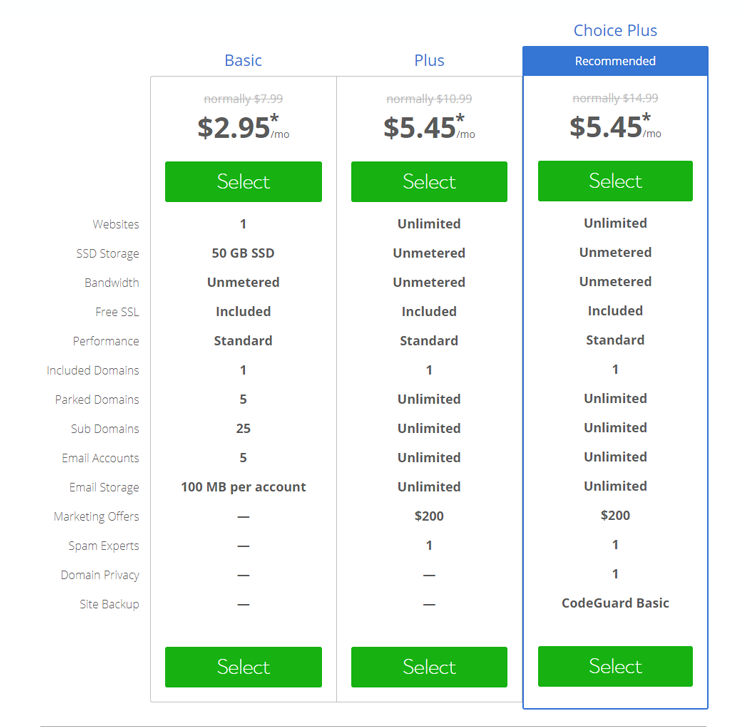 You have to pay $6.95 in the first month and then $13.99 per month is the cost for this hosting. There are 3 general plans for cloud hosting. Starter: This plan starts with $6.95 and after a month it is $9.99. They are providing 1 website. You will get 100 GB of disk space. One free domain is also included. Happy to know that unmetered bandwidth is also provided. Will have a RAM of 2 GB. Performance: This plan costs $8.95 for the first month and then it is $13.99. They are offering unlimited websites for the users of this plan. The disk space is unlimited with unmetered bandwidth. They have included RAM of 4 GB and 1 free domain. Business pro: This is the expensive one that starts with $15.95 and after a month it is $25.99. They are offering unlimited space in this plan. If you came to the topic memory then RAM is 6 GB. You will also get unmetered bandwidth. They are providing one free domain and unlimited websites. These extra offering features are they are giving SSL certificate. Domain backup and restore the advantage. You will also get domain IP and domain privacy. WP standard: This plan starts at $19.99 and after a month is ts $39.99. There you will get storage of 30 GB and backup with 30 GB. There is RAM of 2 GB and visitor/months is allowed to 100 million. They are also providing 1 free domain and 1 dedicated IP. Free SSL certificate is also provided and 30, days money back guarantee. 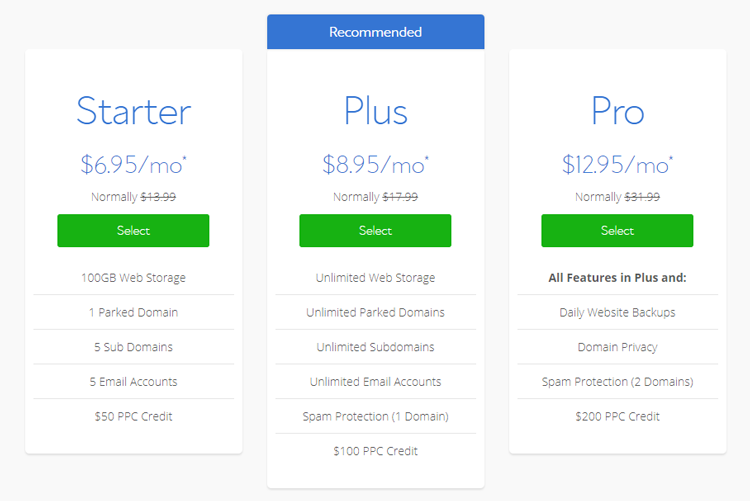 WP enhanced: The first month is of $29.99 and then $59.99. They are providing good features in this plan. You will get a storage of 60 GB and a backup of 60 GB. There is a RAM of 6 GB that is really great. There is also 1 free domain and 1 dedicated IP. Enhanced CPanel and free SSL certificate. 30 days money back guarantee. WP Premium: In this plan, the starting is $39.99 and after the 1st month is $89.99. They are allowing visitors/month 600 million. They are also providing 120 GB storage and 120 GB back up. Included 8 GB of RAM it is awesome. Domain and dedicated IP is same as others in this hosting. 30 days money back security is also there. WP Unlimited: The first month of this plan is $49.99 and the $129.99. Allows visitors/month unlimited. You will get 240 GB of storage and 240 GB of backup. The RAM provided by them is also 8 GB. They are providing 1 free domain and 1 dedicated IP. 30 days money back guarantee is also provided. Thanks to the Bluehost for providing the highest security for its customers. They are providing three layers of anti-spam protection; Spam Experts, Spam Hammer, and Apache Spam Assassin. Don’t worry about your inbox as it is highly protected. Everything is password protected here. For accessing configuration file securely they are providing a top-notch feature named secure shell (SSH). Blacklist IP addresses are also available so you can block access to your site. Another security feature is single-click integration with CloudFlare. This also speeds up the site as well. They have a 30 days refund policy. If you cancel anything within 30 days then you will get the refund of that. A thing to be noted that If you choose to cancel after that, you won’t get a prorated refund for the period of your hosting term which you have not used. Another thing is domain fees can’t be refunded. You don’t need to be a pro or skilled person to easily get access with Bluehost. The enhanced cPanel they are providing is really flexible for all. There are icons for every option. So, one can easily get customization options with just a single click to the icons. You can also manage everything with the websites and emails. And the control panel is easily customizable. So it is very to use. Bluehost is providing 24/7 customer support. Matter of rejoicing that most of the customers report that they have got a friendly, helpful and reliable support from the supporting team. For your any problem Bluehost supporting team tries to solve the problems of customers as fast as possible. Though some people reported that they didn’t get proper solutions to their problems sometimes. There are several ways to contact them. There is a free phone line manned 24/7. You can also contact them via emails. Most advantageous fact is you can have live chat. Bluehost has a large online help section for their customers. So, you can be sure about the fact that their supporting team is very friendly and quick. The advantages of Bluehost is beyond description. I am showing some great advantages of Bluehost. There are several types of plans available. So people with large small or medium industries can hire Bluehost hosting. Bluehost hosting is one of the cheapest web hosting at the present time with great features. Most of their plans have unlimited storage and bandwidth. So people can take great advantage by using this. You will also get unlimited domain hostings from most of the plans. A free domain name is also provided for free for a year with the web host. The cPanel is really easy and it is easily customizable. There is some numerous database such as MySQL, PostgreSQL, CGI-BIN, PHP, Python, Perl, Ruby on Rails, and others. I have already explained about security feature. It is highly secured and don’t worry about it. One click installation system is provided for all their plans. It is very easy to set up. Besides, it saves extra time. Bluehost is integrated with CloudFlare. The performance is really good and according to many users Bluehost is really fast. Woocommerce features are also loved my most of the customers. There are also multiple shopping carts. Besides SSL security is also ensured. You will have practical administration tools that are really awesome. If you are thinking about backup then you are tension free. They provide a reliable backup security. Social networking scripts, blog support, mailing lists, message forums, Joomla and Drupal and Tikiwiki etc. free website scripts are available in Bluehost. The customer support is really appreciating. They are ready to help you always. There are many addons available but a matter of sorrow that you will not get full functionality of many of them. You have to install them if you want to get full functionality of them. If you are on a tight budget then the fact about Bluehost will annoy you that Bluehost always tries to up-sell their customers. About the supporting team.there are many good reports along with some negative reports. Sometimes they are unable to solve the problem accurately. Many people have the objection about the price of WP plan. It is quite costly according to the customers. The fact will make you sad that database usage of Bluehost isn’t truly unlimited. For getting their cheapest price there is a condition that you have to commit to 36 months with them. If you ask me about site migration then I will say it is not truly free. Bluehost is undoubtedly a strong recommendation from me. Very few web hosting companies have such facilities that Bluehost is providing. Though some people and some functions will not be accurate to your desire, most of the advantages you will get may be enough to meet your all needs. Bluehost is providing different kinds of plans and which are perfectly matched with people from different sectors. If you compare the plan facilities and price then certainly you will look no further to other companies. People with large and small industries can have different plans as their need. It is also a great source of help the WordPress customers. Since 2003 Bluehost is carrying on with a big reputation. The customers are raising and it is getting more trusted. So you can grab their plans beyond doubt.